History: Earth-A is an alternate/divergent dimensional counterpart to the Earth-616. (Fantastic Four I#118 (fb) - BTS) - In this world, it was only Ben Grimm and Reed Richards who were aboard the attempted space flight that bombarded them with cosmic rays and granted them superhuman abilities. In this reality, Ben Grimm become Mr. Fantastic, while Richards became the Thing. (Fantastic Four I#118) - The Thing of Earth-616 inadvertently traveled to Earth-A alongside Lockjaw, while teleporting out of an exploding temple during a battle with Diablo. Grimm encountered Reed, who mirrored his form, and learned the truth. (Fantastic Four I#160-163) - Sometime later, Earth-A fell victim to a dimensional spanning scheme of Arkon of Polemachus and the Earth-616 corporation Roxxon, which also involved the Fifth Dimension and the Earth-616. This plan involved inciting a nuclear war among three separate parallel dimensions, which would generate sufficient power to light the realm of Polemachus for all eternity. As part of this plan, Albert DeVoor of Roxxon, established a business known as Inter-Related Technocracies (IT) on Earth-A. DeVoor met with Reed and succeeded in buying out his company, Reed Richards Robotics. DeVoor also established two similar companies on the Earth-616 and the Fifth Dimension. I.T. then sent Richards' Andrones to attack the Fifth Dimension, while simultaneously sending dinosaurs and other "time-menaces" from Earth-616's Reed Richards' time machine to attack Earth-A, and using the Heat-Cold Weapons of Phineas of the Fifth Dimension to threaten a new ice age on the Earth-616. This three-way war progressed as planned until Reed contacted Reed Richards of Earth-616 and told him the truth. Richards of Earth-616 informed the other involved parties and put a temporary halt on the hostilities. Reed then sent the Thing of Earth-616 on a mission to the Nexus through which Arkon hoped to channel the power of the nuclear wars. While Reed helped the other members of the Fantastic Four defeat Arkon's forces and bring down IT, the Thing overpowered the guardian of the Nexus, Gaard, and successfully destroyed the Nexus. Andro, the creation of Dr. Doom formerly known as the Doomsman, established his base on Earth-A. He is no relation to the Andrones. (She-Hulk II#21 (fb) - BTS) - Teaming with his Earth-616 counterpart, Albert DeVoor used Interlocking Technologies in a money-making vacation scheme where the non-powered residents of Earth-A could be sent through an Atomic Resequencer where their molecules would be beamed to Earth-616 (which they call Earth-B) and realigned to match the structure of their Earth-616 counterpart. (Uncanny X-Men#345-346) - She-Hulk of Earth-A (posing as her 616 counterpart) defended the Juggernaut (Cain Marko) in a court of law and then had a sexual affair with him. (Avengers: The Initiative#2-3) - Hulkling & Wiccan of Earth-A impersonated their 616 counterparts. They trained and served in the Initiative. (She-Hulk II#21 (fb) - BTS / She-Hulk II#21) - Interlocking Technologies' plot was discovered and various residents in superhuman forms -- including Armadillo, Beast, Captain Ultra, Dazzler, Albert DeVoor, Dr. Strange, Egghead, Hammer & Anvil, Hulkling, Jack of Hearts, Ms. Marvel, Monica Rambeau, Rhino, Scarlet Witch, Scorpion, 3-D Man, Vermin (deceased), White Tiger, Wiccan, and the Wrecker -- were rounded up, stripped of their powers, and sent back to Earth-A. The Thing of Earth-A assisted Reed Richards-616 with a counterpart device on Earth-A to facilitate the return of the Earth-A natives, though he noted the strong temptation to travel to Earth-616 and realign his atoms with Richards-616. Jen Walters of Earth-616 considered trading places with her Earth-A counterpart, but Reed Richards returned her to Earth-616 and used the Atomic Resequencer to restore her powers (based on the template of her pre-nannite-depowered state her Earth-A counterpart was using). Jen Walters of Earth-712 was happy to be reunited with her lover, Pug. Comments: Created by Archie Goodwin and John Buscema. The Earth-A dimension was shown in the past travels of the entity Vangaard (formerly Gaard), who destroyed redundant realities. Either the reality was NOT considered redundant, or if it were, then a divergent counterpart survived. 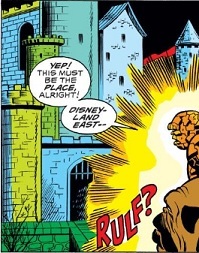 Earth-A was also depicted in Fantastic Four III#47. This info from Olshevksy's Index. Profile by Snood, update by Proto-Man. 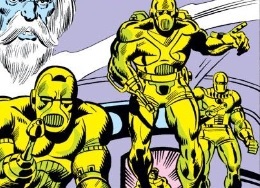 Andrones were the humanoid robots designed by Reed as part of Reed Richards Robotics. They were sent to attack Earth-A as part of the plot by IT. John Anvil was a non-powered Earth-A native who journeyed to Earth-616, where he impersonated his then-deceased, superpowered counterpart (Anvil) there until he was apprehended by the police. 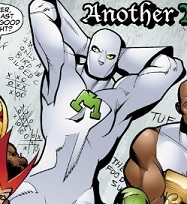 Hector Ayala was a non-powered Earth-A native who journeyed to Earth-616, where he impersonated his deceased superpowered counterpart, White Tiger, until he was apprehended by the police. He was later ordered back through a portal to Earth-A. Alison Blaire was a non-powered, talented song writer on Earth-A who vacationed on Earth-616 thanks to Interlocking Technologies. Once on Earth-616, Blaire impersonated her Earth-616 counterpart, Dazzler, and toured the Midwestern United States with Dazzler's old touring band. Eventually, he impersonation was discovered by the true Dazzler, who angrily asked if Earth-A's Blaire thought Dazzler wouldn't notice a tour. Blaire's only response that she wrote those songs just like her Earth-616 counterpart had. Charles Chandler was a non-powered Earth-A native who journeyed to Earth-616, where he impersonated his superpowered counterpart, 3-D Man, until he was apprehended by the police. He was later ordered back through a portal to Earth-A. Carol Danvers was a non-powered Earth-A native who journeyed to Earth-616, where she impersonated her superpowered counterpart, Ms. Marvel, until she was apprehended by the police. She was later ordered back through a portal to Earth-A. Dorrek VIII was apparently a Skrull from Earth-A who traveled to Earth-616 via Interlocking Technologies, where he teamed with Earth-A's Billy Kaplan and joined the Initiative while posing as their Earth-616 heroic counterparts, Hulkling and Wiccan. When Earth-616's Hulkling and Wiccan learned of the imposters, they chewed out Dorrek and Billy, asking who thought joining the Initiative was a good idea. He was later sent back to Earth-A alongside Billy Kaplan. Mac Gargan was a non-powered Earth-A native who journeyed to Earth-616, where he impersonated his superpowered counterpart, Scorpion (who was active as that point as Venom), until he was apprehended by the police. 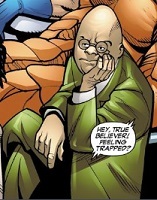 A non-powered tourist from Earth-A, Dirk Garthwaite traveled to Earth-616 via Interlocking Technologies, where he posed as his Earth-616 counterpart, the Wrecker. After many of Inter-Locking Technologies' tourists were taken into custody, the Wrecker's name was found on Albert DeVoor's tourist list as he rampaged through town. 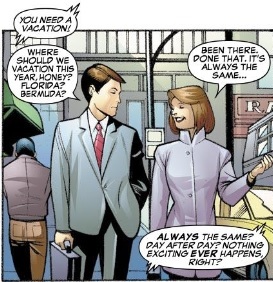 When his appearance was noticed by Earth-616's Two-Gun Kid and a Vault Guardsman, they requested Earth-616's She-Hulk's help but She-Hulk allowed her Earth-A counterpart, who was also vacationing on Earth-616, to take care of Garthwaite. 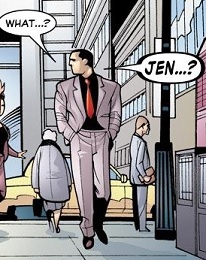 After being defeated by Earth-A's Jen Walters, Garthwaite was met by Earth-616's Jen Walters, who explained that he would need a good lawyer specializing in Inter-Dimensional Immigration. Garthwaite then asked Jen Walters how long the law case would take, as his kids had a soccer game the following Sunday. 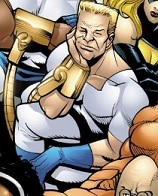 Griffin Gogol was a non-powered Earth-A native who discovered that he had a superpowered counterpart on Earth-616 and decided to vacation there while posing as his counterpart, Captain Ultra. Meeting with Earth-A's Albert DeVoor, Gogol walked through the Atomic Resequencer device and was beamed to Earth-616, where his genetic makeup was realigned to match that of his superpowered counterpart. Emerging via Earth-616's Atomic Resquencer, Gogol discovered his superhuman strength and met with Earth-616's Albert DeVoor, who helped orient Gogol to Earth-616 and provided Gogol with the Marvel Handbook entry on his counterpart, Captain Ultra so he could learn about his newfound powers and Captain Ultra's history. Admitting that the Handbook entry looked somewhat boring, Gogol learned from the outdated Handbook entry that Captain Ultra had a fear of fire (unaware that Earth-616's Doc Samson had cured Captain Ultra of his pyrophobia) and then expressed discontent at his multicolored costume. Earth-616's DeVoor stopped Gogol there and warned that under no circumstances should Gogol change his costume or break character in any way. Susan Storm Grimm never went on the space flight and so never gained the powers of the Invisible Girl/Woman. She married Ben Grimm instead of Reed Richards. Jack Hart was a non-powered Earth-A native who journeyed to Earth-616, where he impersonated his then-deceased, superpowered counterpart (Jack of Hearts) there until he was apprehended by the police. When Earth-A's Jennifer Walters was also apprehended, Hart told her not to sweat it and while her vacation was over, at least she had a good time. Inter-Related Technocracies, Unlimited was the name for the Earth-A branch of Roxxon's IT plot. It was run by Albert DeVoor, and bought out Reed Richards Robotics in order to send his Andrones to attack the Fifth Dimension. It was presumably renamed Interlocking Technologies sometime later. Leroy Jackson was a non-powered Earth-A native who journeyed to Earth-616, where he impersonated his deceased, superpowered counterpart (Anvil) there until he was apprehended by the police. William Kaplan was an Earth-A native who traveled to Earth-616 via Interlocking Technologies, where he teamed with Earth-A's Dorrek VIII and joined the Initiative while posing as their Earth-616 heroic counterparts, Hulkling and Wiccan. When Earth-616's Hulkling and Wiccan learned of the imposters, they chewed out Dorrek and Billy, asking who thought joining the Initiative was a good idea. He was later sent back to Earth-A alongside Dorrek. Wanda Maximoff was a non-powered Earth-A native who journeyed to Earth-616, where she impersonated Scarlet Witch, her superpowered counterpart until she was apprehended by the police. Henry McCoy was a non-powered Earth-A native who journeyed to Earth-616, where he impersonated the Beast, his superpowered counterpart, where he attempted to make money off of the Beast's patents. When he was discovered, Earth-616's Beast chewed McCoy out, reminding him that the patents were of his ideas and that intellectual property laws extended across dimensional barriers. Earth-A's Augustus "Pug" Pugliese was the significant other of lawyer Jennifer Walters. When Earth-A's Jen Walters was ordered to return to her own reality, she immediately saw Pug walking down the street and reunited with him, who admitted he had tried calling and calling to find her. Jen revealed that she had been on another world, a world where no one loved her the way he did. Pug admitted that it wasn't a world he'd want to live and Jen agreed, asking Pug to kiss her. Monica Rambeau was a non-powered Earth-A native who journeyed to Earth-616, where she impersonated her superpowered counterpart until she was apprehended by the police. When she was later sent back to Earth-A, Monica attempted to tell Earth-616's Lt. Stone that her traveling to Earth-616 wasn't about the powers and that she just wanted to visit a reality where her parents were still alive but the cold Lt. Stone ordered her back into the Atomic Resequencer and back to Earth-A. 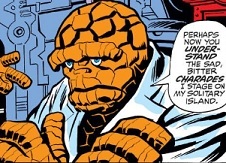 Reed Richards was transformed into the hideous form of the Thing. Bitter over his transformation and the loss of the woman he loved, Richards exiled himself to an island. Initially delusional over his losses, he exiled himself to a secluded island and designed a large number of scenes and robots, patterned after various eras on Earth, such as the @ England @ the late 19th Century, England @ the Crusades, and the O.K. Corral. In each of these cases, he designed the villain of these eras, such as Moriarity, the sheriff of Nottingham, and the Clanton Brothers, to have the form of Reed Richards. In this way, he acted as his subconscious hatred for himself. It was during this period of his life that he first encountered the Thing. Sometime later, Reed recovered from his profound depression sufficiently to establish a company, Reed Richards Robotics. This company designed the Andrones. Reed was duped by Albert DeVoor of Inter-Related Technocracies into selling his company, in exchange for much-needed cash to fund his continuing experiments. Too later, Reed learned of the true plot of IT, and he traveled to the prime Earth in an effort to gain help from the Thing. Before he could do so, he was attacked and overpowered by Arkon, and taken to the IT base. After some time there, he managed to reach across the dimensional barrier and contact Reed Richards I and explain the truth to him about the extra-dimensional attacks. He then met up with the Thing I who had traveled to Earth-A in search of him, and had been captured as well. The two escaped from IT and helped put a stop to the inter-dimensional wars. Reed accompanied the the Fantastic Four on a mission to bring down IT, and he succeeded in overpowering Arkon himself. Reed of Earth-A assisted Reed Richards-616 with a counterpart device on Earth-A to facilitate the return of the Earth-A natives, though he noted the strong temptation to travel to Earth-616 and realign his atoms with Richards-616. Reed possessed superhuman strength and durability roughly comparable to the Thing (Class 90). He lacked his training and the fighting spirit. Reed was a genius inventor, specializing in the creation of robots. 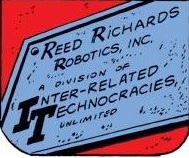 Reed Richards Robotics, Inc. was the name of Reed's Androne designing company. It was bought out by Inter-Related Technocracies as part of the IT plot. It was based in a castle on a deserted island, and surrounded by a moat of acid. Riochards designed robots and androids of every size, every shape, and every use. Many of these had the forms of normal humans, while other possessed more monstrous forms and abilities. 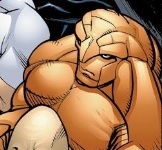 Antonio Rodriguez was a non-powered Earth-A native who journeyed to Earth-616, where he impersonated Armadillo, his superpowered counterpart until he was apprehended by the police. Elihas Starr was a non-powered Earth-A native who journeyed to Earth-616, where he impersonated Egghead, his superpowered counterpart until he was apprehended by the police. He was later ordered back through a portal to Earth-A. Stephen Strange was a non-powered Earth-A native who journeyed to Earth-616, where he impersonated his superpowered counterpart, Dr. Strange, until he was apprehended after failing to find a rhyme for "Cyttorak." Aleksei Sytsevich was a non-powered Earth-A native who journeyed to Earth-616, where he impersonated his superpowered counterpart, Rhino, and ultimately battled Earth-A's Jennifer Walters, who was posing as her own Earth-616 counterpart, She-Hulk. Edward Whelan was a non-powered Earth-A native who journeyed to Earth-616, where he impersonated Vermin, his superpowered counterpart. At some point, he died and his remains were cremated. When the law offices of Goodman, Lieber, Kurtzberg and Holliway learned of the Earth-A incursion, Earth-616's Vermin visited their offices and showed them the remains of Earth-A's Edward Whelan to prove that he was alive and that his Earth-A counterpart had perished.